Our Australian cities are growing rapidly and we are becoming an increasingly urbanised society. 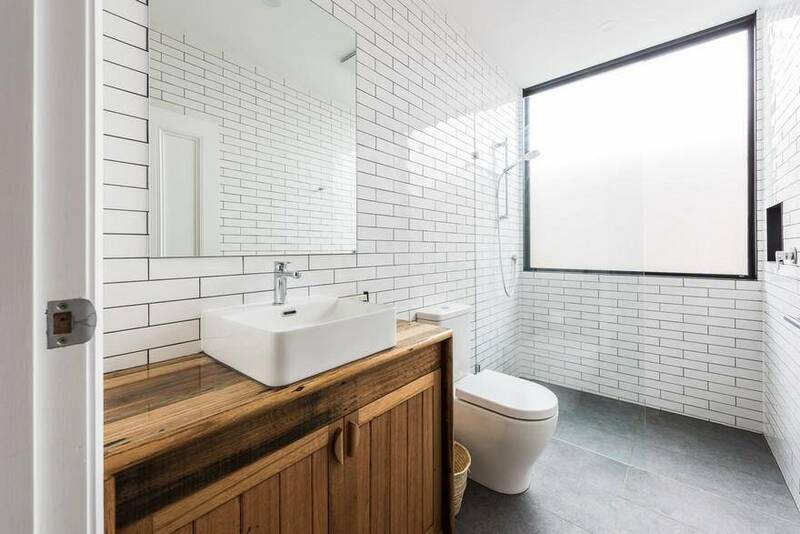 Melbourne overall averages around 1-2 storeys high which is why we have a population of just under 5 million where cities like London have 10 million within the same footprint, without relying on high rise living. As we grow towards 8 million by 2050, we can either intensify or spread out. It is well established that greater density can drive an economy that in turn we can harness to drive better social and environmental outcomes – improved provision of services and amenity within our immediate neighbourhoods, better levels of service in our public transport, and even greater affordability. This is something that we are passionate about and is a central focus for the Urban Creative practice. 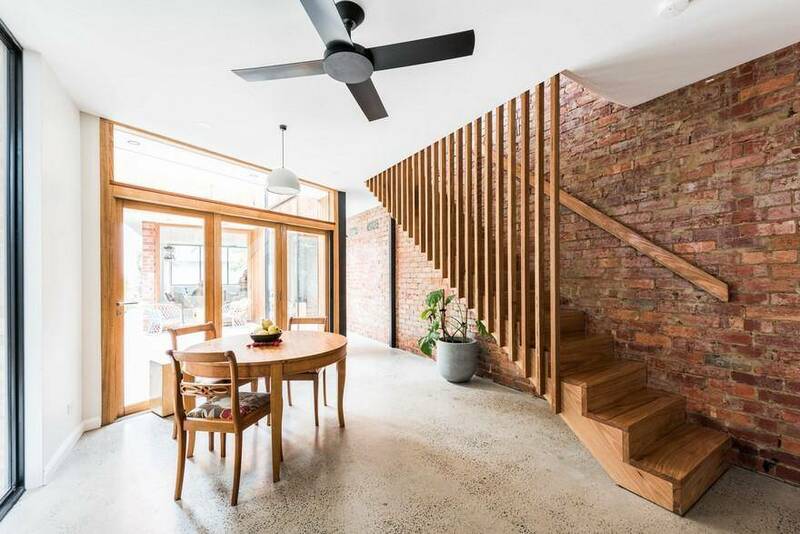 Sitting on a 5.5m wide site, and bounded by 6m high walls and behind an existing shop, this 3 bedroom Ascot Vale House in Melbourne’s inner west has deployed a number of clever strategies to transcend its constraints. 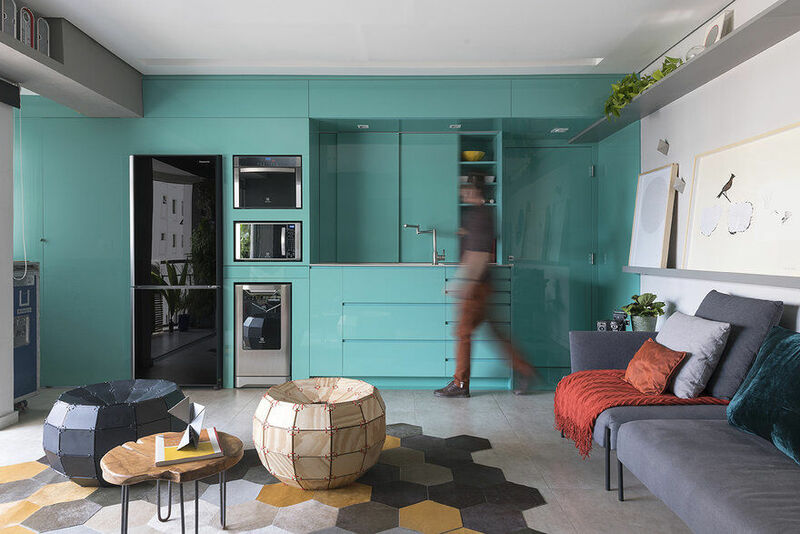 A light filled courtyard occupies the centre of the home, creating a sense of interconnectedness and expansiveness, where in reality the dwelling is in some places as little as one metre in width. The courtyard allows daylight to enter deep into the living spaces despite a challenging orientation. 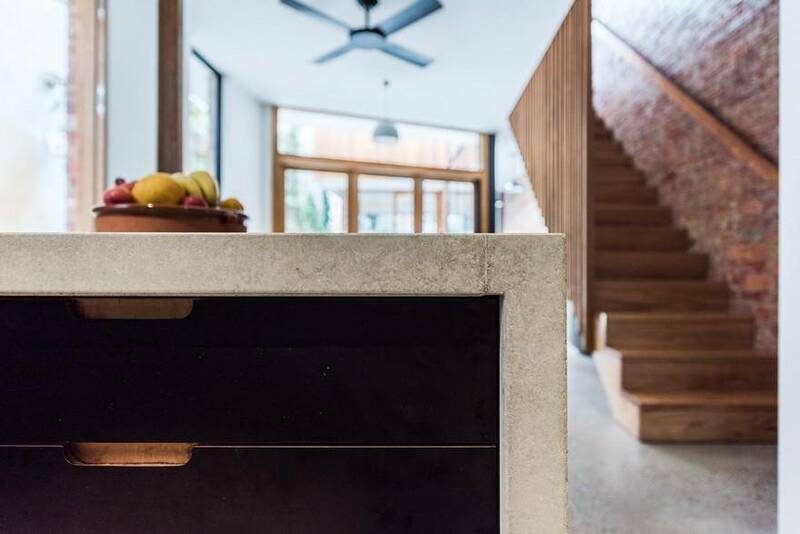 It also drives a passive cross ventilation strategy across the entire home, through creating a pressure differential – a device that has been used for centuries. 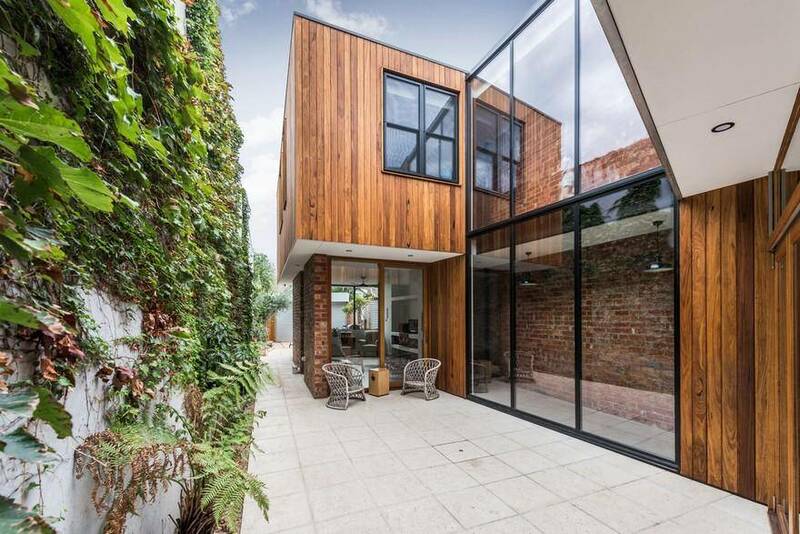 A double height glazed wall also partially acts as a trombe wall, capturing early morning solar gain onto the retained masonry party wall and providing passive heating in winter. In warmer months this is able to be controlled by blinds. 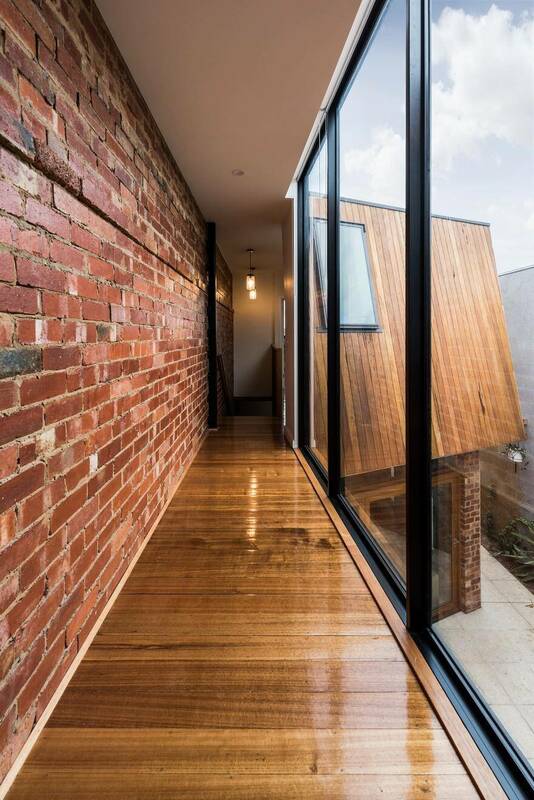 The original brick party wall has been uncovered and cleaned back to expose its rich warmth throughout the main axis of the dwelling. 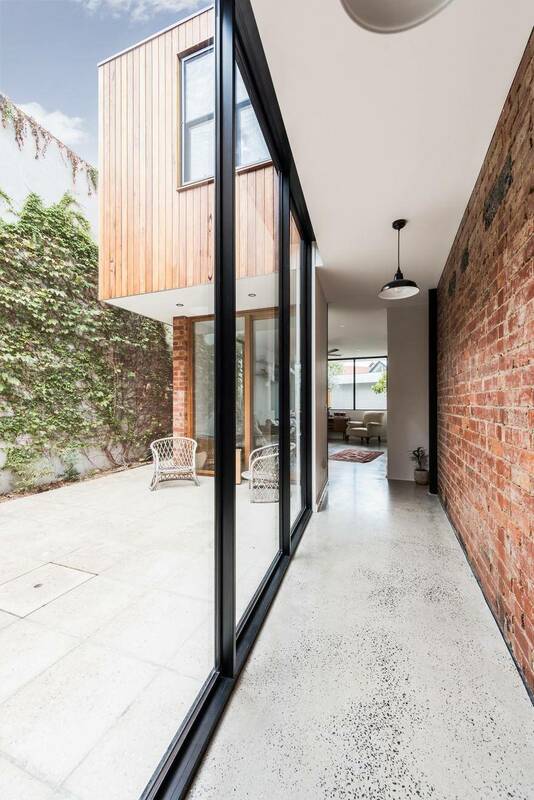 Not only does this avoid the use of new materials to construct this facade but both dwellings on either side of the party wall serve to insulate each other. Bricks from the original dilapidated structure on-site have been reused in the facade of the ground floor, and other elements were recycled through careful hand demolition and segregation of materials. 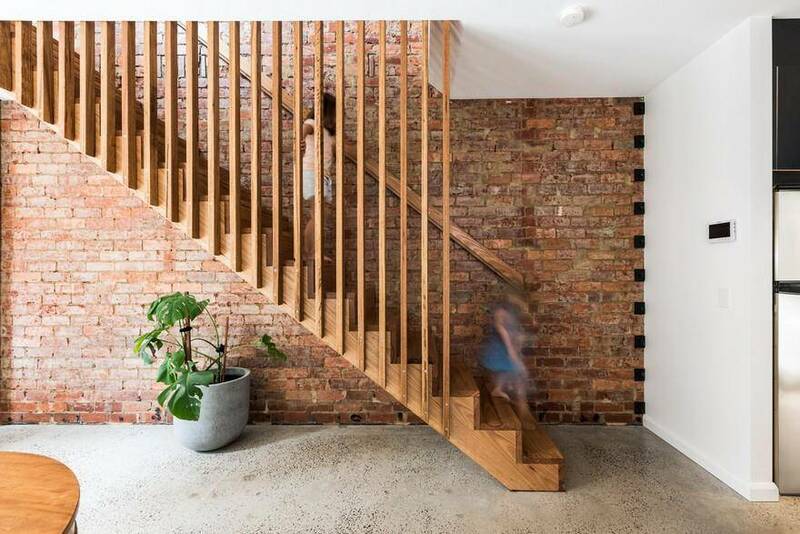 Locally sourced recycled materials were used throughout the dwelling, including the timber stairs, floorboards, repurposed internal solid timber doors, recycled timber shelves in the living room and the reconditioned steel framed window in the kitchen. 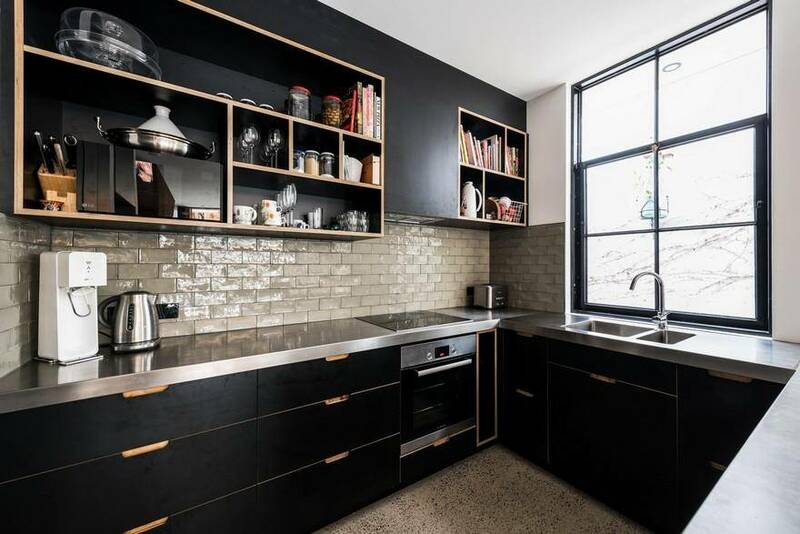 Low VOC materials have been used through out including the shelving and fireplace which have been finished with Tadelakt, a moroccan rendering technique using lime plaster sealed with olive oil soap. The ground floor structural slab has been hydronically heated and polished, avoiding the need for further material usage. 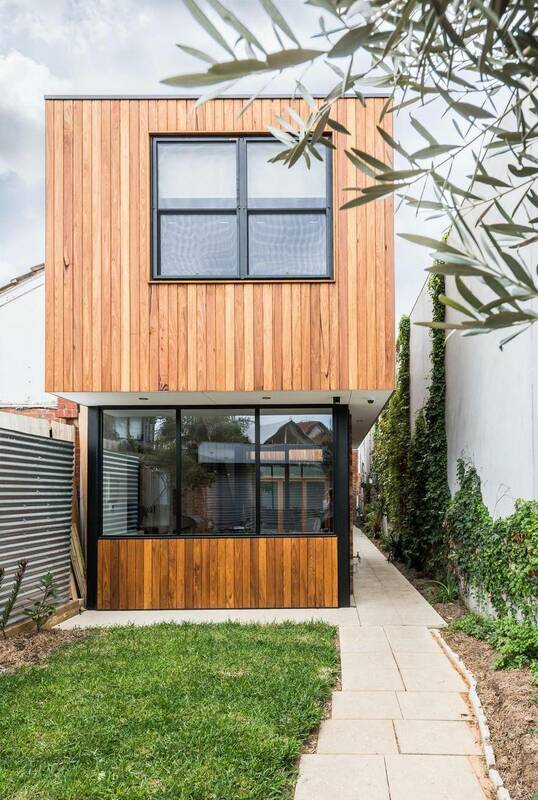 The Ascot Vale House uses solar power and an efficient hot water heat pump as well as recycling rainwater. 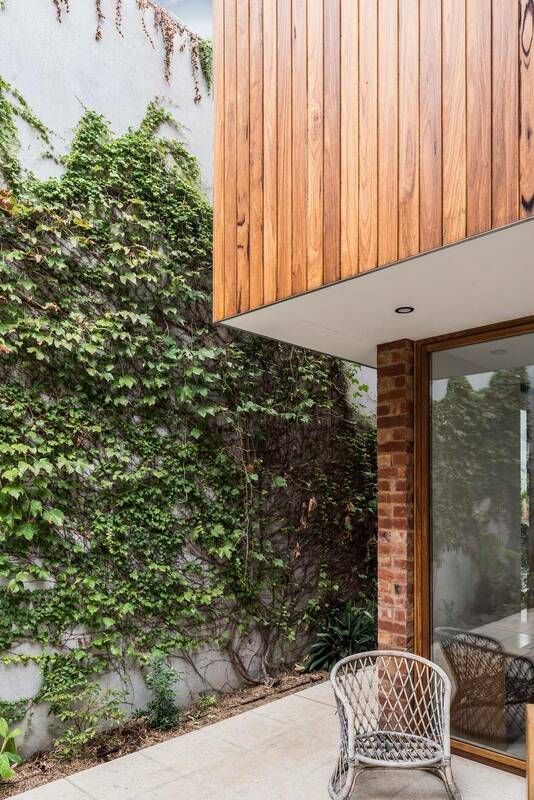 Existing planting on the very tight site was carefully maintained throughout construction and a vertical green wall now provides a backdrop to all the living spaces of the dwelling. 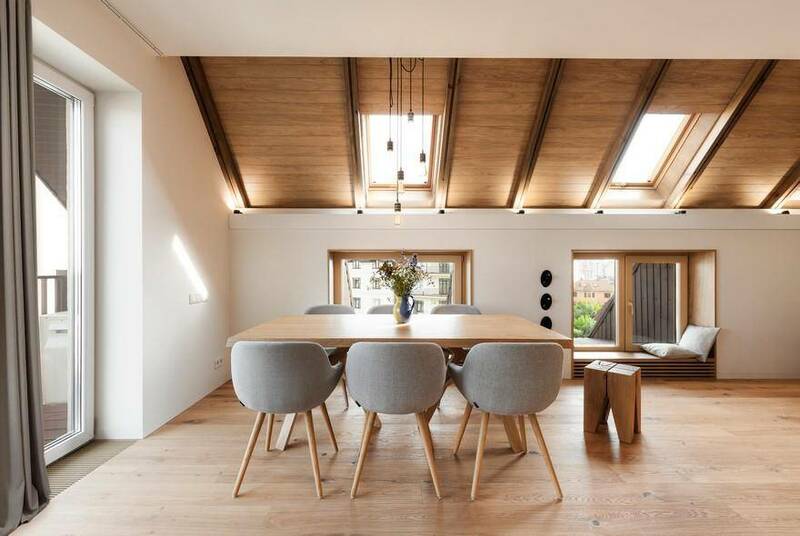 In this way the original dwelling on site – a dark and gloomy single storey uninsulated dwelling with no outlook – has been replaced with a light-filled joyous new home. 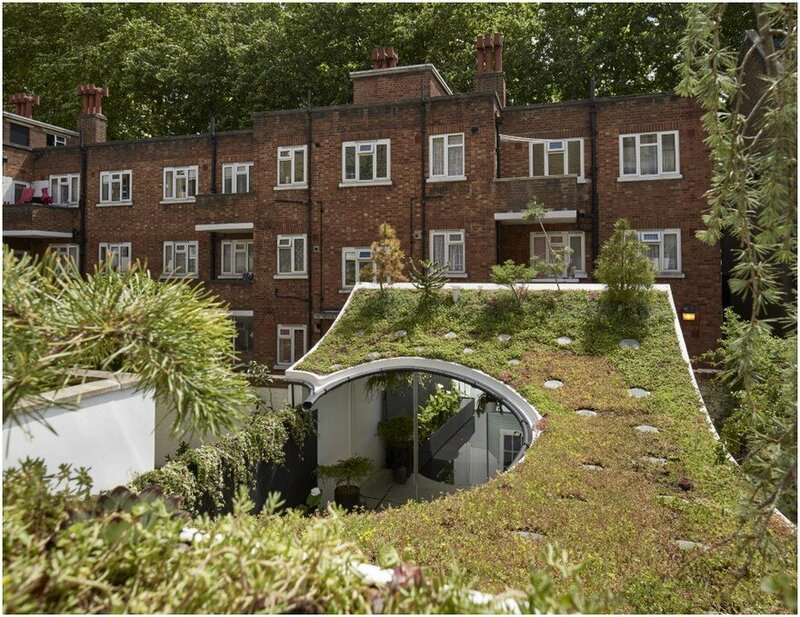 The major achievement of this project though is how it demonstrates how we can make the most of very small pockets of space within our cities to create a richer and more diverse urban landscape.